We finally got to see the amazing Cowboys Stadium!! We can't afford a game, but we did have the privilege of going to their annual home school day (reason enough to home school!!!). It was incredible! We got a VIP tour, saw views from club level seats, a luxury box, and the standing room only area. We got to go onto the field and run and play and pass and kick. We had our picture taken on the star. We visited the locker room and the press room. It was awesome! We're already looking forward to going again next year and spending even more time there! The boys and I waiting for our tour to begin. Dawson is a #1 fan! Dawson and Ben with their tickets. Some of the biggest Cowboys fans (and fans-in-training) ever! Our view from club level. Dawson and Ben in the luxury suite - so awesome! View from standing room only. 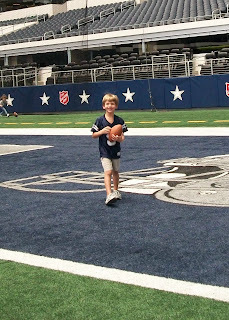 Dawson on the 50 yard line. Ben and Dawson trying to keep John from scoring a touchdown. They made it to the end zone! 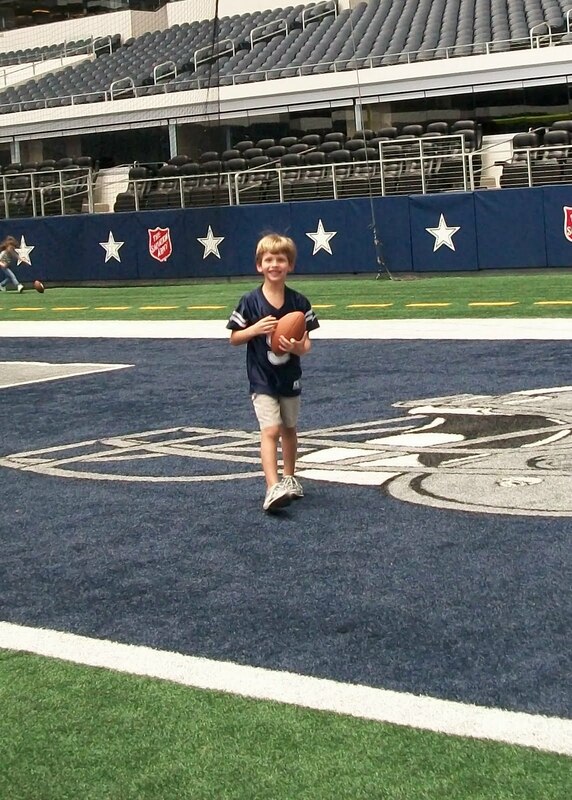 Dawson was so happy to play on the field. He had this great big smile the whole time. In the locker room, wearing his Romo jersey, sitting by Romo's locker. So cool that he got to wear the jersey with pads and all. The Witten jersey swallowed Brady. As always, we had an amazing time at the Houston Children's Museum. Hanging out by the giant kid cutouts before we headed in. Dawson and Brady laughing as they turn the wheel together. Brady climbing up to the obstacle course. He made it through the tunnel. Making his way through the ropes. The boys on the rock wall. He made it all the way around. This is one of Dawson's favorite attractions at the museum - the massive 2 story climbing structure. Brady building some Lego cars. Dawson ready to launch his Lego car on the track. James and Dawson experimenting with the pipes and ping-pong ball course. Both boys loved this game - launching the disc and attempting to bounce it off various surfaces to hit the lighthouse. A big spinning wheel - they both wanted to do it over and over again. This was a really cool music-making exhibit. Having fun with the balance. Brady enjoyed building with these blocks. Lights reflecting off mirrors is so fascinating. The simple fun of playing with cars. Another car to play in, this time a police car. Dawson's dream job - being a cashier. He would have stayed here for hours. Ready to cook something special at the diner. Waiting at the counter to place their orders. Veterinarian Brady checking the puppy's ears. Listening to the puppy's heartbeat. Peeking out of the tree house ropes. Kaelin and Dawson working to fill the big bucket with water so they can watch it dump out. Brady said, "I'm just gonna wait and watch the eggs hatch."